The Kamp-Rite Double Kwik Camping Cot is an essential camping item that provides you with means of enjoying your sleep when you are far away from home. Given that most people go camping as a group, carrying individual cots can consume a lot of space. Firstly, the camp cot provides enough space for two people to sleep comfortably. Secondly, the cot is easy to set up as it opens up quickly. The camping cot also allows you to sleep off the ground, thus promoting your comfort. Moreover, its steel frame ensures that you sleep safely without the need to worry about any falls. Additionally, the cot is made from strong polyester fabric that makes it durable. Consequently, the cot can be used even in rocky camping sites. The cot is also easy to store and maintain its shape and cleanliness as it has a carry bag that helps you keep it neatly after every use. The Kamp-Rite Double Kwik Cot can also be used for indoor activities. It can be used when you have guests as it provides the comfort of a bed when you add a mattress to it, since it does not come with one. It is sold with a one-year limited warranty. It will be replaced if it has manufacturing defects. 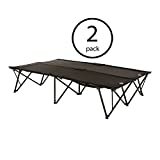 Kamp-Rite Double Kwik Cot is the best when camping as a couple or when you are with people you can share a cot with. It is quite sturdy and easy to carry as it comes with a zippered bag. Moreover, the camping cot bed is made from strong fabric that will last many uses. Have you tried this double camping cot? Let us know what your impression is. What pros and cons can you list from your experience? It is always great to hear from people who walked the walk and can share their knowledge.